During much of Barack Obama’s presidency, Millennials have been some of his strongest supporters, rating his job performance much more positively than those in older generations. And today — with Obama’s overall approval rating at 51%, the highest in nearly three years – the generation gap in approval is among the widest since he took office in 2009. About six-in-ten (62%) Millennials (adults born after 1980) approve of the job Obama is doing. By comparison, half of Generation Xers (born 1965-1980), 43% of Boomers (born 1946-1964) and just 37% of Silents (born 1928-1945) offer positive ratings of the president’s job performance. There has been a generation gap – the difference between the youngest group, Millennials, and the oldest, Silents – in ratings of Obama for much of the last seven years. But the gap has fluctuated widely over this period. Throughout much of 2014, Obama’s approval ratings among Millennials hovered near 50%, compared with the roughly 35% of Silents who approved of Obama. Over the past year, Obama’s ratings among Millennials have risen, while the ratings of older generations (particularly Boomers and Silents) are little changed. When it comes to education level, the president enjoys substantially more support from those with college degrees, and particularly those with postgraduate degrees. Today, 62% of those with postgraduate degrees approve of his job performance, along with 54% of those with bachelor’s degrees. Among adults with some college experience but no degree, 47% approve, as do 49% of those with no more than a high school degree. As has been the case throughout Obama’s presidency, blacks are overwhelmingly positive of his job performance: Currently, 91% approve of his handling of his job as president. Similarly, the president garners positive ratings among Hispanics. Today, 65% of Hispanics approve of his job performance. However, whites continue to be more likely to disapprove (56%) than approve (38%) of the president’s performance, as they have been throughout most of his presidency. As in the past, Democrats continue to overwhelming approve of Obama, with fully 85% saying they approve of the way he is handling his job as president in the most recent survey. 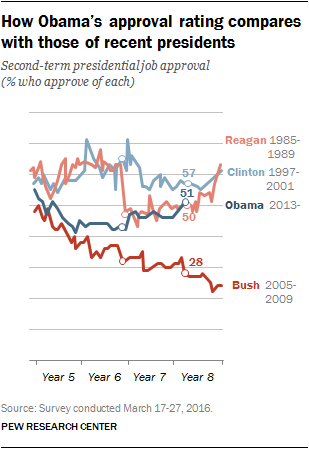 Conversely, Republicans rate Obama much more negatively. Just 11% say they approve of the president, while 85% say they disapprove. Democratic approval of Obama is as high as it has ever been, while Republican approval is as low as it has been over the last seven years. About half of political independents (48%) say they approve of the president. Obama’s overall job approval rating stands at 51%, while 44% disapprove. His current job rating places him just below Bill Clinton’s (57% approved) in March of his final year in office, and is nearly identical to Ronald Reagan’s at a similar point in his presidency (50%). Clinton finished his presidency with an approval rating of 61%, while Reagan rallied in his final year to finish at 63%.